You want to gain more outreach for your blog content and drive more traffic to your blog? Cross-posting and cross-promoting your content to the social web is the most efficient way to do so. In our blog series, we focus on a different social network each week and show you the most simple way to connect it to your WordPress blog. Today, we will focus on Facebook. Facebook is the most popular social network with over 7.2 billion page visits a day and 1.6 billion users in total. Thus, cross-promoting your blog post on Facebook is standard to most bloggers. Therefore, it’s particularly important to connect your WordPress with your Facebook account. You are new to Blog2Social? Then let me tell you how it works. 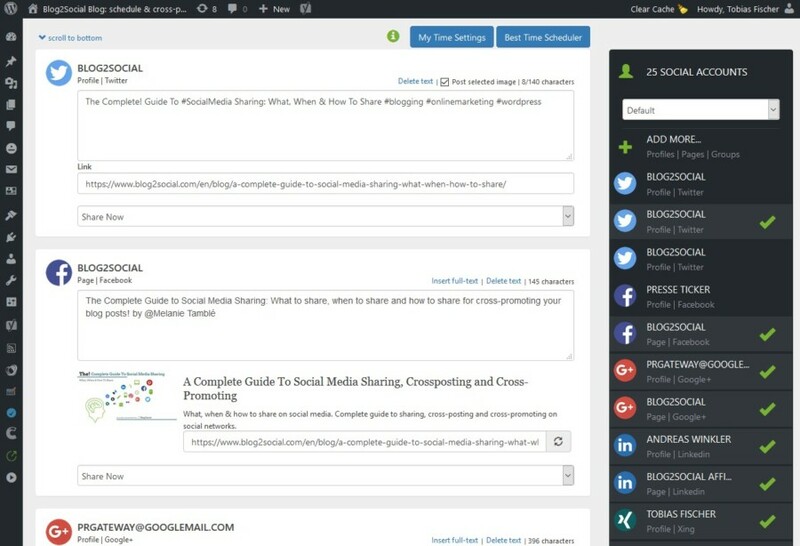 If you already have Blog2Social skip step 1 and proceed with step 2. 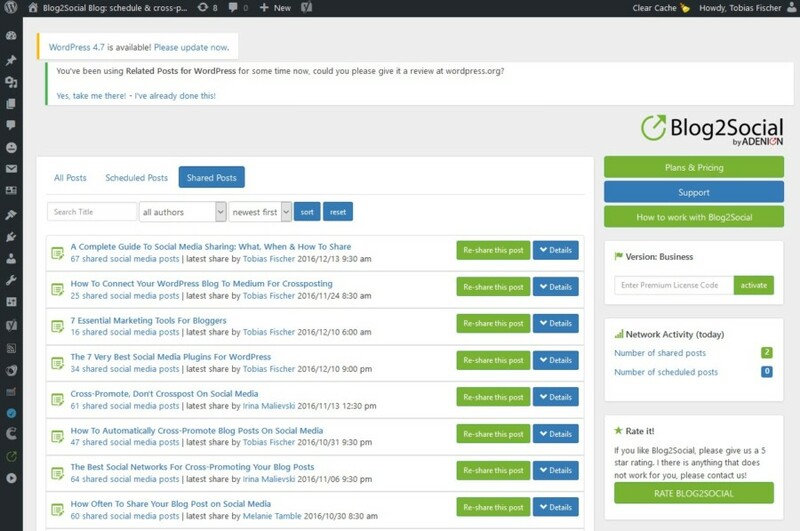 Blog2Social is a WordPress Plugin and a real time saver. Copy- and pasting each of your postings on various networks won’t be necessary any more. You can re-publish your blog content automatically from WordPress to Facebook and other social media platforms. Download the plugin from the WordPress directory in your WordPress plugin section. Install and activate Blog2Social to get it going. It's free. Once you have installed and activated Blog2Social on WordPress, the Blog2Social Icon will show on your WordPress Dashboard. Click on the icon to get to the networks section and connect your Facebook account. When you type in your login data, your Facebook account will be automatically connected with your WordPress blog. 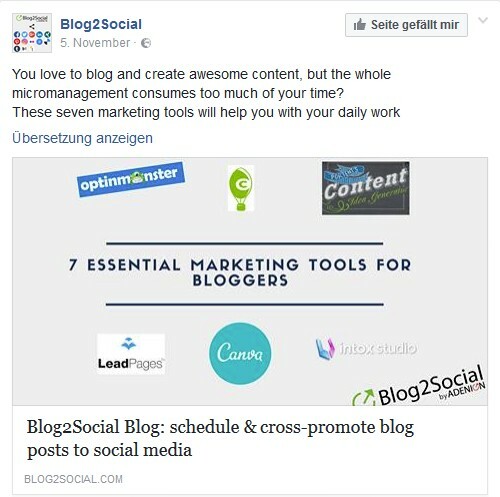 After you have installed Blog2Social, you can cross-post, cross-promote and re-publish your blog content to any social network you have connected the plugin to. With just one simple click. But, since we are focussing on Facebook, I will tell you exactly how you can cross-post your new blog content and re-publish old one on the most popular social network. Once you have finished a new blog post, you have two options to share your post on social media. The first one is by far the quickest. Just hit the Social Media Auto-Posting button and your post will be shared immediately on every connected network according to your profile settings the moment you click on publish. The second option allows you to customize your post. I‘d recommend this option, since customized posts are the best way to increase your visibility and engagement rate. 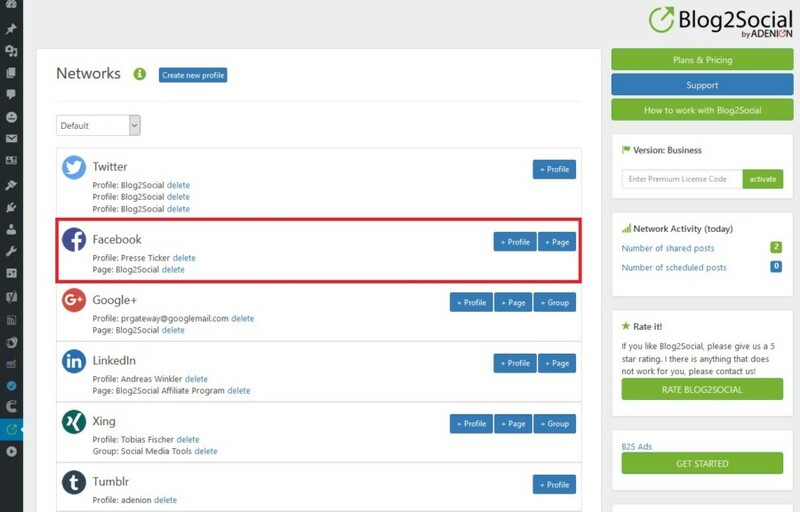 A click on "Customize & Schedule Social Media Posts" will get you straight to the one page preview dashboard. Every community is different, has its own preferences and social rush hours. Therefore, a basic knowledge of your Facebook community, is crucial for your social media success. So you should become familiar with the preferred times of your followers. This way you gain the most outreach and attention. The best times to post on Facebook might give you a basic orientation. If you do not know the best times for your networks, you may adopt the default Best Time Scheduler, provided by Blog2Social. These times are based on a comprehensive research of various sources and experience of established social media experts. Or, you can set your own time settings. If you are ready to go, just click "publish" and your post will automatically be cross-posted to Facebook. 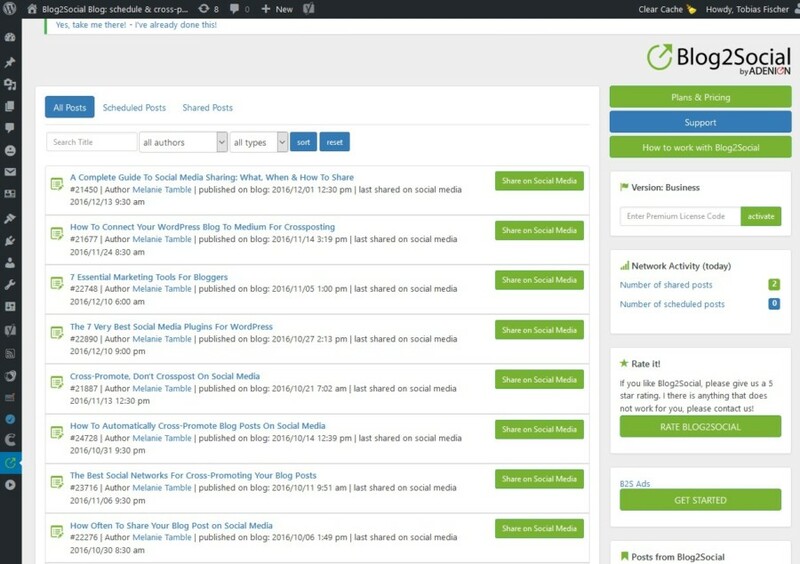 And you can also cross-promote your post on any other social network you chose in your cross-publishing plan on the right site of your Blog2Social dashboard. All postings will be published automatically according to your scheduling scheme. You can see your published and scheduled social media posts, when you click on "All posts" in the Blog2Social section of your WordPress navigation bar. You can also change your scheduled times here. Another asset of Blog2Social is the option to re-publish your older posts on Facebook. There are two ways to do so. First: You open an old blog post in your WordPress edit mode and take the road described in the section above. 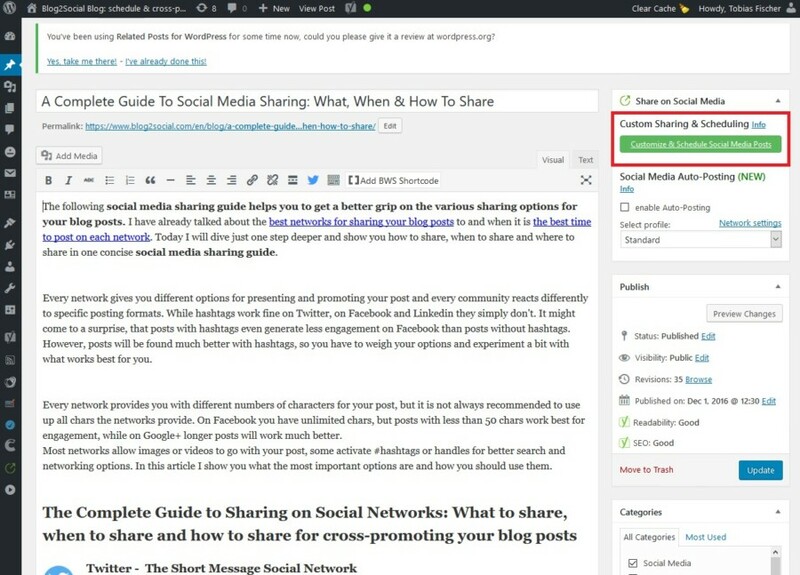 Second: You go straight to the Blog2Social dashboard and choose “All Posts” and click on “Re-share this post”. You will then choose the networks you wish to re-publish your content to. And again you may schedule your posts according to the best time for each network. If you want to pre-schedule your planned, but not yet published blog posts you can do this with the Blog2Social plugin, as well. As soon as you have planned your blog post to be published at a specific time you may also schedule the posts for your social networks, as described in Step 3.1. Social media are the most powerful sources to drive traffic to your blog. The more value your blog content provides, the more likely your followers will like your blog and your business. Facebook may be just one social network, but it is a real traffic powerhouse. However, also consider other networks provided in the plugin to put your WordPress posts in front of different target groups and an engaged audience.